Serving Residential and Business Clients. The Highest Quality, Most Affordable Tree Trimming Services in Poway, El Cajon, Santee, La Mesa, And Surrounding Areas. 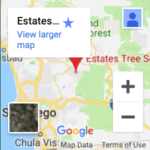 Estates Tree Service is a San Diego based Family Owned and Operated tree care company that provides the highest quality tree trimming services in San Diego, La Mesa, Santee, Poway, La Jolla, Escondido and the surrounding areas throughout the county. We have been serving San Diego County since 1992, our more than 25 years of experience has made Estates Tree Service the tree trimming specialists in the area, each one of our expertly trained staff members is highly trained and experience in the art of tree trimming, they know exactly how to trim a tree’s branches, which can improve the health and safety of your tree while bringing out its natural shape and beauty. Our business is Licensed, Insured, and BBB A+ Rated for our expert Tree Trimming, Tree Cutting, And Tree Care services. Starting a job with Estates Tree Service is as easy as requesting a Free, No-Obligation Estimate. We will provide the most affordable tree trimming costs along with our expert recommendations and expert results, you’ll be happy you went with estates for your residential or commercial tree trimming services. The Importance of Tree Trimming in San Diego. When Tree Trimming and Care is ignored, trees can become overgrown with branches and leaves that weigh the tree down and make it unsafe. These trees then lean over power lines, homes, driveways and other structures presenting a hazard for your property and anyone that visits. As trees become top-heavy branches start to break off and can cause serious damage. Choosing the wrong tree trimming company can also be a hazard when trees are not properly pruned or cut by an inexperienced tree care company too much of the tree may be trimmed off which will cause it to grow back larger, stronger, and heavier. Additionally, if limbs are trimmed incorrectly or at the wrong time it can wound, damage or stress the tree leading to disease that could kill the tree. Knowledgeable in Trimming, Including Pine Trees, Palm Trees, Eucalyptus Trees and More. At Estates Tree Service we strongly believe that a healthy tree is a strong and safe tree. Our staff’s dedication to training and constant improvement means that we will trim your tree’s in a way that will leave them looking their best, growing stronger, and healthy for years to come. Our staff follows all of the industry’s best Tree Trimming practices for all types of trees, including Olives, Pines, Oaks, Palms, Elms, and fruit trees. We also equip our staff with the best equipment which leads to the service being completed faster, safer, and at more affordable rates, it also helps us to ensure that the tree trimming service we provide is the highest quality in all of San Diego including Tree Trimming Ramona. Call for a Free On-Site Estimate for our Residential or Commercial Tree Trimming Services. When you contact Estates Tree Service for your 100% Free, No-Obligation Estimate, you’ll be meeting with the owner of the business Tom, who has decades of experience in San Diego Tree Trimming Service, he will not only provide you with an affordable estimate but also with his advice based on years of experience, these recommendations are meant to save you money, make your property safe, and keep your yard looking great! 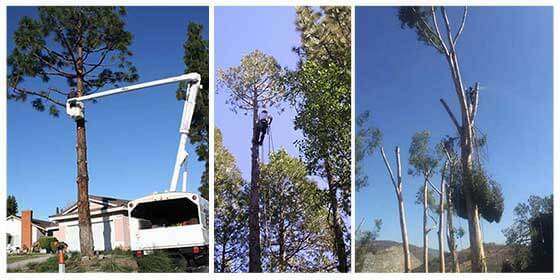 Our skill, attention to detail, workmanship, and respect for your property are unrivaled in the San Diego Tree Service industry. We are available 24/7 for emergency services and can arrange our services and estimate at a time that is convenient for you. Our jobs always end with our crew leaving your property better than we found it, this means we always clean up all branches and foliage before leaving your property. Crown Reduction is tree pruning that decreases the height and spread of a tree, our skilled tree trimmers can properly cut back the appropriate limbs to achieve the proper shape. This will maintain the remaining limbs and overall health of your trees. Crown Thinning involves selectively pruning tree limbs in order to increase light penetration and improve the structure of your tree, regular tree trimming is recommended for the health and safety of your trees as it allows more light penetration and more air flow through the leaves and branches of the tree which in turn makes it less likely to break during high winds. Crown lifting involves removing the lower branches of a tree to provide clearance underneath for a variety of reasons including pedestrians, fences, buildings and more. If your trees are hanging down over a path or walkway it is time for tree trimming from Estates Tree Service. Tree Pollarding involves severely pruning the head of the tree the first year followed by continued spot removal each year after for years to maintain a modest size for larger tree species. Pollarding is not effective for every species, during your Free Estimate be sure to ask if your tree is a good candidate for this type of tree trimming. Palm Tree Trimming is common in Southern California, these beautiful and luxurious trees are known to leave a large amount of debris during storms and as they age. To maintain the look and appeal of your Palm trees it is suggested to have regular tree trimming services performed. Dead fronds, especially from Mexican Fan Palms are known to be homes for rodents such as mice and rats.